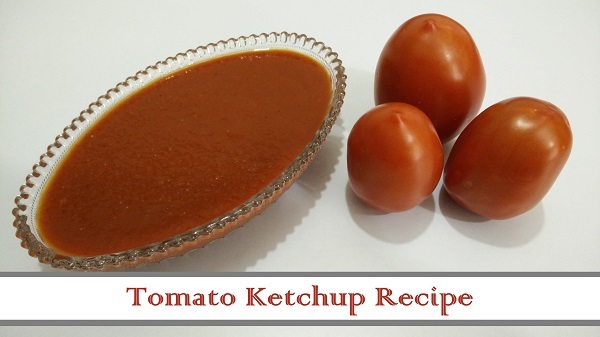 A simple and delicious recipe of Tomato Ketchup using fresh Tomatoes. This is a healthier alternative to processed ketchup. In this simple recipe, I will show you How to make Creamy and Tangy Ketchup at home. Rinse the Tomatoes well in water and roughly chop. Add Onion, Ginger, Garlic and grind all ingredients. Heat the blended mixture in a pan over medium heat. Add Sugar, Cinnamon Powder, Clove Powder, Black Pepper Powder and Kashmiri Chilli Powder, mix well. Stir continuously and cook for 10 – 15 minutes over medium flame. After 15 minutes, boil the mixture over the high flame for 5 minutes, keep on stirring at intervals. Lower the flame, add Salt and mix well. Filter the ketchup using a sieve. Homemade Tomato Ketchup is ready, you can store in the refrigerator and consume within 15 days. To store for a longer period, add 1 tsp Sodium Benzoate after cooling down the Ketchup. This can be stored for 2 months in the refrigerator.